At least 2 days a week, older adults should do muscle–strengthening activities that involve all the major muscle groups. These are the muscles of the legs, hips, chest, back, abdomen, shoulders, and arms. Muscle-strengthening activities make muscles do more work than they are accustomed to during activities of daily life. 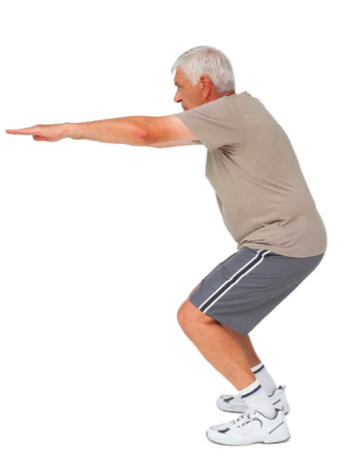 Examples of muscle-strengthening activities include lifting weights, working with resistance bands, doing calisthenics using body weight for resistance (such as push-ups, pull-ups, and sit-ups), climbing stairs, carrying heavy loads, and heavy gardening. Muscle-strengthening activities count if they involve a moderate to high level of intensity, or effort, and work the major muscle groups of the body. Whatever the reason for doing it, any muscle-strengthening activity counts toward meeting the Guidelines. For example, muscle-strengthening activity done as part of a therapy or rehabilitation program can count. No specific amount of time is recommended for muscle strengthening, but muscle-strengthening exercises should be performed to the point at which it would be difficult to do another repetition without help. When resistance training is used to enhance muscle strength, one set of 8 to 12 repetitions of each exercise is effective, although two or three sets may be more effective. Development of muscle strength and endurance is progressive over time. This means that gradual increases in the amount of weight or the days per week of exercise will result in stronger muscles.